On a cool night in early June, a handful of Brooklynites stand on the corner of Driggs and North 10th in Williamsburg, about to set out on a pilgrimage. It’s the first night of Bushwick Open Studios—the opening of artists’ studios to the devoted followers of the Brooklyn art scene. The Brooklyn band New Villager is slated to go onstage at midnight as part of the festival. The original plan called for pilgrims to undertake the three-mile trek on foot, singing and dancing, from the Williamsburg art gallery Black & White Project Space, where New Villager just opened an installation, to St. Mark’s Church in Bushwick. But what will turn out to be an especially stormy New York summer is just beginning, the air rain-heavy. A baptism and a pilgrimage might be too much for one night. The sky looks this close to erupting. Seams of lightning unravel across the thick pink-black night, and everyone huddles beneath the elbows of a few umbrellas so broken they seem held up only by gusts heavy with the smells of metallic petrichor and really strong pot. Improvisation, it turns out, is a key to any successful pilgrimage: dancing through the streets has been nixed, if the travelers hope to get to the church on time and dry. A silver minivan coasts up to the sidewalk, the band’s de facto tour bus. We have all just met, and I had actually planned on quietly slipping out of sight and onto the subway after viewing the artwork and snapping some pictures. Climbing into a van with this group of strangers, however, now seems like the right thing to do. Suddenly, I am embedded. As we pile inside and on top of each other, the van starts to feel more like a getaway car. The giddy relief of escaping the weather settles into a warm conversation among old friends. I sit and listen. The pin oaks wave from the sidewalk, and just as we turn onto Metropolitan Avenue, it starts to pour. 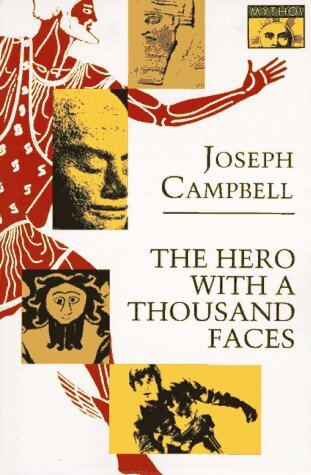 This is a story about music and art, and it all begins with a book: The Hero with the Thousand Faces, by the mythologist Joseph Campbell. Over the last 60 years, CampbelI’s influence slow-burned its way through a variety of art forms—music and installation art like that of New Villager’s as well as into the creations of major pop-culture heavy hitters like George Lucas and the Wachowski brothers. CampbelI’s best-known book deconstructs the common narrative among the world’s myths: the author documents and, in a consequence he may not have envisioned, continues to spark our human instinct to create. New Villager’s founders, musicians Ross Simonini and Ben Bromley, followed the folklorist Joseph Campbell as students in Santa Barbara a decade ago. Bay-Area natives, Ross and Ben met through a mutual friend at UC Santa Barbara, where they bounced through a few bands together. Ross played guitar, Ben sang and played piano—a line-up that hasn’t changed. After graduating, Ross went on to get his MFA in fiction from Bennington College and took over as Interviews Editor at the The Believer. Ben made music with the experimental electropop group Fischerspooner. After years of trying to get something going together, they finally holed up in a cabin in Forestville, just north of San Francisco, where they spent a lot of time talking about Joseph Campbell and his seminal work. The Hero with the Thousand Faces identifies a common cycle driving myths forward across cultures and eras: the Hero’s Journey, or the monomyth. As Campbell writes, “A hero ventures forth from the world of common day into a region of supernatural wonder: fabulous forces are there encountered and a decisive victory is won: the hero comes back from this mysterious adventure with the power to bestow boons on his fellow man.” Campbell breaks the journey down into roughly a dozen stages, grouped under three stages: departure, initiation and return. Even those unfamiliar with Campbell or his terminology can easily recognize the philosophies from his books The Hero with a Thousand Faces and The Masks of God. The monomyth motif—the hero’s journey—runs through stories ranging from Siddharta to “Star Wars,” from The Iliad to The Matrix. You can even catch a reference to the popular PBS-Bill Moyers special, the “Power of Myth,” in an episode of The Gilmore Girls. The record New Villager holds 10 songs that advance through those three overarching stages of the monomyth: departure, initiation and return. The collective follows this same architecture for its art installations. Just as Campbell acted as a kind of code breaker for Joyce, laying out the logic of Finnegan’s Wake for the curious, so New Villager translates Campbell’s monomyth into artistic and musical code. One must be familiar with the monomyth to decipher the universal in the personal. The New Villager weaves its code into motifs that reoccur in the music, art, and videos. The code includes symbols, colors, and characters. The band creates striking and visually rich videos that feature elaborate costumes constructed from forest debris or household objects. In a video for their single “Lighthouse,” a dancer in an armor-like suit made of unraveled reels of video-cassette tape, shakes and twirls as Black Crow Boy, their hero. Ross Simonini wears red, for the past; Ben is painted blue, the color representing the future. In the video, the pair appears in that order—past, future—and Black Crow Boy makes his way from one to the other. “It all just sort of played itself out in time, it just sort of made sense to us,” says Ben. New Villager set up its show at Black & White Gallery as a monomyth game. A circle of everyday objects—a glove, teddy bear, corkscrew, a Pokey toy from Gumby, a comb, all selected, “half choice, half chance” according to Ben—lay in a circle in the concrete courtyard of the gallery. All the objects were in code colors—red, blue, green, black and white. Codes are meant to veil, but also to challenge. Without the breakdown from Ben and Ross, I would never have made the literary connection between Joseph Campbell and the band’s music. New Villager creates shimmering anthems—enchanting, florescent, joyous intellectual pop lifted by emotional ambition. Ben and Ross call their performance/exhibitions “integrated events.” The one on Long Island invited viewers to physically act out each step in the hero’s journey through a series of interactive games involving springboards, tumbling mats, and the unraveled video-cassette tape of the Lighthouse music video. In the monomyth cycle, after returning home, a hero must figure out how to share his journey. Enter Eric Lister, a childhood friend of Ross’s, and the fourth member of the band. New Villager’s most successful integrated event came with an early installation at Temporary Culture gallery in LA in 2011. The band constructed 10 rooms, one for each song/stage, then lived, worked and played in those spaces for 10 days. The LA Times likened it to “a refugee camp for space monsters.” The guys reused materials from their videos in the installations and tossed rolls of iridescent black-brown cassette tape to create a forest for people to walk through. It made a beautiful rustling, and one with purpose, as many of New Villager’s lyrics concern lost time. For their next music project, the collective plans new music, a new line-up, a new cycle. One wonders: Will the group stick to the same mythology, starting a new cycle to act out Joseph Campbell’s monomyth? Or will it now look for a new code, starting its own hero journey? During the pilgrimage drive, it really pours. The bright red lights of traffic smear the windshield. It will be a stormy summer. We arrive at St. Mark’s, a beautiful, crumbling church of red brick, stained glass, orange construction barriers. We enter through the basement, down a propped-up yellow slide. The band converted the pulpit into a stage. New Villager goes through its usual pre-performance ritual, a meditation with three claps before beginning to play. It’s not a religion, and it’s not optimistic—Ross and Ben emphasize this—but there is no denying the spiritual. The Hero with the Thousand Faces depends on the intervention of the supernatural. Apollo serves as the god of healing and the god of music for a reason, I think, as I watch the band play from the pulpit. Everyone tonight has come to church for a kind of worship. Ben’s shadow paints the church wall as he plays keyboard. Ross, barefoot, looks down at his guitar. The enduring power of Joseph Campbell’s monomyth might be its application of a magical but attainable logic to ordinary life. Inside an abandoned Lutheran church, moldy German bibles and empty beer cans clink around the feet of couples making out in the confessionals. A group of dancers do the Hora in front of the stage. Here in church, New Villager is just a band playing to a crowd of people who want to hear them. Those people dance for the first time all night, and they will leave a little bit changed because of it. They’ll take their own codes home through the rain. I take mine and quietly slip into the subway. J. Nicole Jones holds an MFA in creative nonfiction from Columbia University. Her work has appeared in Harper’s Magazine online and on Capital New York. A native of South Carolina, she lives in Brooklyn.